I have lovingly restored this beautiful quirky villa and have enjoyed the process. The villa has a wonderful feeling and is nice and cozy with insulation, a HUGE woodburner, heaters, new carpets and lots of blankets and beanbags to snuggle into. Full kitchen available including oven and gas hob for self catering. Its a place to reflect, socialize, explore, eat, practice yoga, read and study. A place to find what you are looking for. A fully equipped kitchen, large dining table and open plan connecting lounge makes this a great space to share with friends and family. Kumara village has lots to offer and is in a great central location to other attractions on the West Coast. Rivers, lakes and beach all within 10 minutes drive. Hokitika and Greymouth are 20 minutes, Punakaiki is an hour and the glaciers, ski fields, mountains and Westport are within 2 hours drive. Come and enjoy the area with the amazing Wilderness Cycle Trail, walking and mountain biking tracks. The stars are great viewing and the area is a photographers dream. Not to mention the award winning Theatre Royal Hotel within walking distance. Look at for more. I live in a cottage on site to help with bookings, local advise and anything else you can think of, I will do my best to make your stay perfect. Some Pets allowed with prior approval. Unfenced section. Check in between 4pm and 8.00pm unless agreed in advance. No cashpoint or supermarket in village. Gardens are currently being landscaped and are a little wild in places. Please bare with me. Every day is a good day when you wake up to birdsong and go to sleep with the owls. Relaxing peaceful time in Kumara. Kate made us most welcome, and our extended family enjoyed the cottage immensely. We loved this property. It was perfect for our needs. We had a large group and so we booked out the house and dorms. The location is perfect - the middle of everywhere but away from everything. The host has thought of everything, so we didn't want for anything. I loved the jars of homemade relishes, jams and fruit available for sale. 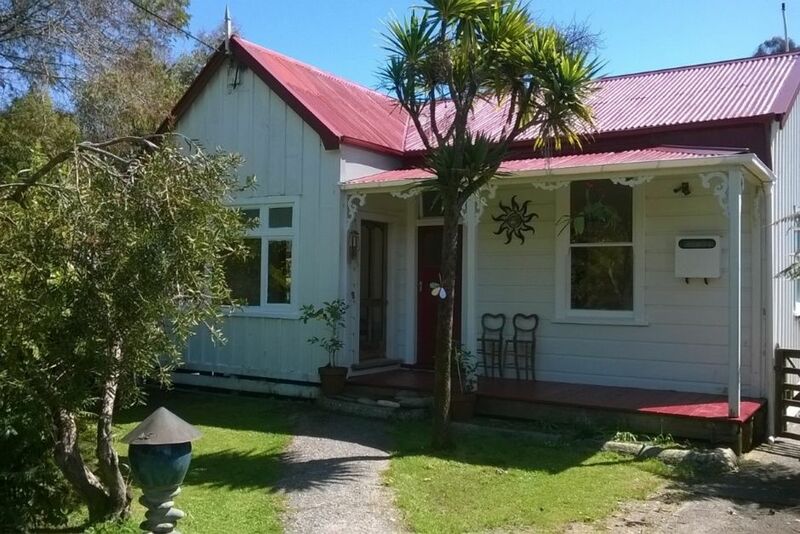 The property is a wee piece of paradise well placed between Hokitika and Greymouth. The property is a wee piece of paradise well placed between Hokitika and Greymouth. Being dog friendly is a huge plus. The cottage is adorable and super-comfy. Only thing is you feel really guilty if you're warm and dry inside the house while it's raining and others are out in the open (but covered) communal kitchen just outside the window!